The first full week of January is the time to get ahead of the rest of the year. Now is the time to put forth our trends and predication for the coming year. 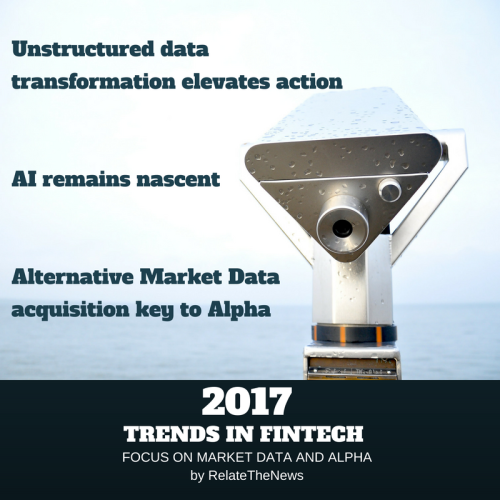 With our mission at RelateTheNews to transform unstructured data into actionable insight for the capital markets our focus for 2017 trends will be on alternative market data and resulting trends in driving alpha. Unstructured data elevates action – The first trend prediction of 2017 is that the need for actionable structured data will accelerate as a requirement for generating alpha in the capital markets. The key to insightful and actionable structured data is the transformation of unstructured data into these actionable insights. A leader in the institutional investment arena, Backstop Solutions Group, has put together a great look at the year ahead in their “The Top Ten 2017 New Year Resolutions Every Alt Firm Should Make“. Backstop Solutions drives home the importance of structured data and the necessity of that data to be actionable in their first 2 2017 resolutions for alternative investment firms. Alternative market data acquisition key to Alpha – Investment firms already utilizing alternative market data from satellite images, gmail receipts and sentiment data will continue their hunt for insightful and actionable data to give them an edge in generating returns. In 2017 traditional firms will begin to embrace these alternative market data sources to aid in portfolio selection, trade timing and risk management. Looking back at Backstop Solutions 2017 resolutions we see, Resolution #10: Don’t Wait, which speaks directly to the need to constantly be acquiring news sources of actionable and insightful market data to generate alpha.